Kristen Federico demonstrates her "Magic School Bus" proposal. Mrs. Federico was awarded the 2013-2014 Interactive Whiteboard Focus Grant. With the success of iPads in the Classroom still looming, the Westerly Public Schools Technology Department and WEEF decided to offer another collaborative grant for an Interactive Whiteboard System in the spring of 2013. WEEF was looking for innovative, creative ideas on how to use an Interactive Whiteboard System in the classroom that would fall outside the ordinary, yet promise to augment the school curriculum in a meaningful way. Kristen Federico, a first grade teacher at State Street School, wrote a proposal that brought grant committee members out of their seats. Mrs. Federico's "Magic School Bus" proposal would bring “magic” into her classroom the way Ms. Frizzle from The Magic School Bus series did. Ms. Frizzle had an anthropomorphic school bus which took her students on daily field trips to impossible places, such as the solar system, the bottom of the ocean or even inside a human body. Mrs. Federico wanted her students to experience learning in the same interactive, innovative and creative way. She demonstrated to WEEF grant committee members how she would take her students on field trips to the Bronx Zoo, Times Square or Niagara Falls with the Interactive Whiteboard with just a touch of a finger! She promised that an interactive white board system would revolutionize her instruction and her students' achievement and so far, she has delivered. Mrs. Federico starts using the whiteboard the minute her students walk through the door. Each student comes in and touches a character that was assigned to them through an interactive attendance website. She has found that her students are so much more engaged in learning when there is an interactive component to it. Her students watch daily YouTube and SchoolTube videos which have songs and videos that align to their curriculum. Her students have just begun singing a song called "Doubles Rap" to help them memorize their doubles math facts. 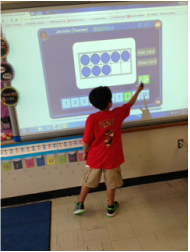 Most recently, Mrs. Federico began a district wide discussion group about the interactive whiteboards. The group meets monthly to share information, best practices and ideas with each other. When asked how the Interactive Whiteboard System has impacted her teaching, Mrs. Federico replied, "This board has helped me to become a better teacher, and helped my students to become more engaged in my lessons." WEEF is grateful to teachers like Mrs. Federico who carry out it's mission by providing opportunities for enhanced educational experiences to Westerly students. Great job Kristen!